Getting it right at The Wong! Horncastle Town Council has formed a new working group in an attempt to hammer out an agreement regarding the future of The Wong. The site is owned by East Lindsey District Council but town councillors fear it could be sold off for re-development to raise much-needed funds. In recent years, the Wong Working Group (WWG) - chaired by town and county council Bill Aron - has attempted to secure the whole or part of the site for community use. Last year, the group handed over negotiations with the district council to the town council. The new group comprises of town councillors Brian Burbidge and Jonathan Ferrari, along with the town’s three district councillors - Fiona Martin, Richard Avison and Sandra Campbell-Wardman. Mayor Coun Angela Birchall admitted the group faced a ‘difficult job’ but hoped they could end what she called the ‘deadlock’ in negotiations. Speaking at last week’s town council meeting, she added: ”We have all read about the financial state of our district councuil but hopefully there is a way forward. Coun Burbidge said it was ‘time to draw a line in the sand’ and not dwell on previous negotions. He admitted the new group would ‘probably look’ at the ‘workings’ of the WWG but stressed reaching an agreement with ELDC was the main focus. Coun Aron defended the WWG. He said it was still in existance and would provide any assistance towards an agreement. Speaking before the meeting, Coun Aron said the community had worked hard for 25 years to try to protect what is left of the Wong. 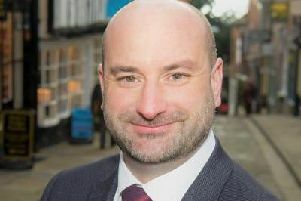 Coun Aron said that an ideal solution would be along the lines of the deal struck with ELDC regarding Stanhope Hall which is now a successfully run community asset. Coun Avison has previously indicated that ELDC is looking at all its land assets - including The Wong - and is expected to produce proposals in June. The Wong is a Scandanavian term for pasture or common land and used to be owned by the Manor of Horncastle until it was given to the people by Edward Stanhope MP. Until the late 90’s there were still sheep and cattle pens that were used in the beast fairs.